Assumption is still around today, in a different location than above. Now Quinsigamund College is on the grounds. This building suffered heavy damage during the 1953 tornado, two nuns and a priest were killed.The original campus was built in 1904 by the Assumptionist Fathers. It was the first Franco-American college in the country. After the 1953 tornado, it was relocated to its present location on Salisbury Street. 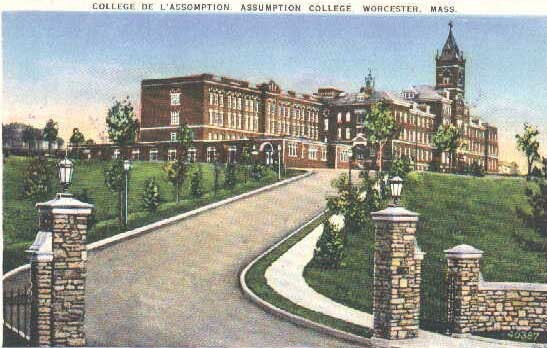 The following are links about Assumption College you may find interesting. Also check out the other pages. Pictures here at WorcesterMass.com of present day Assumption. Link to the college website. The following are comments left about Assumption College from site visitors such as yourself. They are not spell checked or reviewed for accuracy. Now Quinsigamund College is on the grounds. This building suffered heavy damage during the 1953 tornado, two nuns and a priest were killed. The original campus was built in 1904 by the Assumptionist Fathers. It was the first Franco-American college in the country. After the 1953 tornado, it was relocated to its present location on Salisbury Street. I found an old book at the New England Historical and Genealogical Society called "Old Landmarks and Historic Spots of Worcester, Massachusetts" writen by Spears and printed in 1931. In it he is talking about historic places along the Lincoln St route and he mentions " As we turn towards the city and pass through Greendale, the Assumption College is to bee seen on the hill to the left. Here was celebrated the first Joan of Arc Mass in the United States on Sunday, May 8, 1910." I am a recent friend of the College. I jog on the grounds and around the neighborhood. The students, faculty and even security guards are just great. The college is super too as far as asthetics! Too bad I'm too old to attend college. All the men in my family went to this school. My dad was a student there for 8 years (as a high schooler and then as a college student). Both schools were combined until 1953 when the tornado hit. After that the college was relocated to Salisbury Street and the school shown above became Assumption Preparatory School. It was a boarding school run by the Assumptionists. In closed in 1969 one year after I graduated. My brothers had gone there in the fifties. They spent their entire four years in the one building. I was lucky because my years were spent in a new field house, a new classroom building and this one shown above. It was a great school - and the priests, brothers and lay teachers taught the basics very well and taught one to think rather than just parrot answers back. It was an all-male prep school and we played sports against the likes of Tabor Academy and Worcester Academy. We went to school Monday through Saturday mornings. We had Wednesday afternoons off as did most prep schools so we could play them in sports. Since many students boarded it didn't matter if you went to class on Saturdays. There were several international students in my class. They came from Kenya and Thailand to mention just a few places. Most students however were Franco-Americans (Americans of French-Canadian ancestry) and they came from the Northeastern US for the most part. It was a sad day when Assumption closed. By the way - the mascot of Assumption College was and still is the Greyhounds. The prep school's mascot was The Monk. The founder of the Assumptionist order was Father Emile Dalzon and he never came to the United States from France. His order did however. The motto of the school was "Je maitiendrai" - "I shall uphold" and I hope that I upheld the memory of the school even just a little bit. In fact the school's year book was called "Memini" - Latin for "To remember." Adieu to all grads of the College and the Prep. It has been years since I have been to Assumption Preparatory School (1958-1959), as a foreign student, but looking at the building above, where I lived in the second floor, I had fond memories of my classmates and dedicated teachers, specially its Director Father Burns, as well of my fellow tennis team players and coach. I just learned from one of the comments it had closed down in 1969, I am sorry to have learn that. 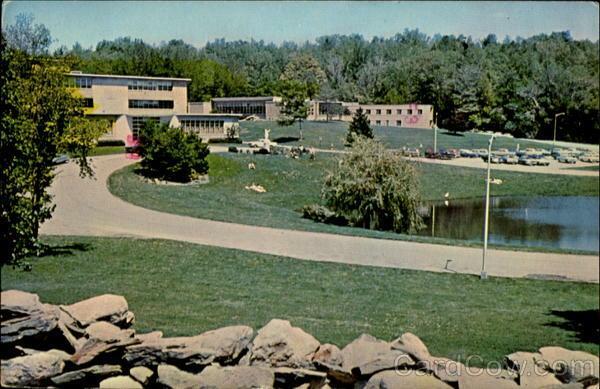 The Assumption Prep school of this image closed down in June of 1970, not 1969. I left the school halfway through my Junior year at Thanksgiving of 1969 and my brother finished his Freshman year in June of 1970 when the school closed for good.